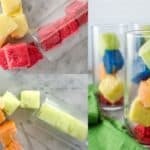 Why have boring lemonade when you can jazz it up with these naturally coloured (and flavoured) Rainbow Ice Cubes to make your own Rainbow Lemonade (or any other kind of drink/cocktail)! Every sip is an explosion of fruity flavours! Did you guys see my previous post where I made easy fruit sorbets with raspberry, peach, pineapple and honeydew melon? It’s deceptively easy to make fruit sorbet like this and seeing all those gorgeous colours of those sorbets, I was struck with another idea! Have you guys had rainbow lemonade before? 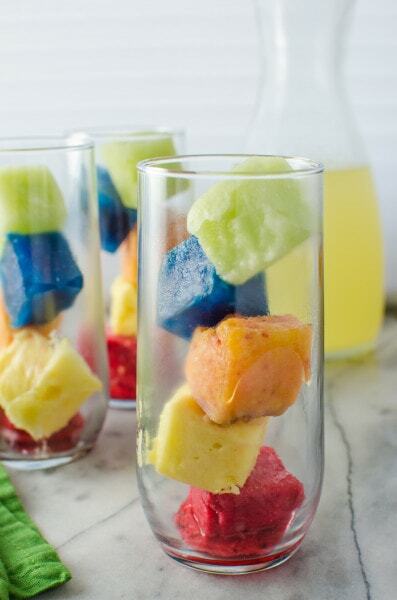 The idea is to make rainbow coloured ice cubes and then stack them up in a glass and pour lemonade in and voilà, you got pretty rainbow lemonade! Kids go wild over these things and it’s also a great idea for your kids’ next lemonade stand! What I didn’t like about all those recipes available online on how to make rainbow lemonade was that they all used artificial food colouring (and artificial flavours) to make rainbow ice cubes. So I figured, when nature provides us with such a wonderful bounty of fruits of all sorts of colour, why bother with articifial food colouring? So this is my way of making rainbow lemonade with natural colours and flavours (and rainbow ice cubes). But forget all those colours, the beauty in this is in how ridiculously easy it is to make it! Pineapple is missing in this picture, but you get the idea right? I made coloured rainbow ice cubes out of the fruit sorbets that I made in my previous post and then stored them in freezer bags. That way, I had all the colours ready for when I needed them. To get Blue and Purple, you can easily use blueberries (blue) and blackberries (purple) the same way. I didn’t do that in this post however. While I didn’t use blueberries to make blue ice cubes in this post, I did something even better! And it’s called butterfly pea tea! 🙂 There isn’t a great deal that I remember from my 6th grade science class in school, but one lesson that I remember very well was how we used liquid from the Butterfly Pea flower (which was smashed/ground and mixed with water) as a natural (colour) indicator for acidic solutions! Butterfly pea is one of the best natural sources of colour used in food and cosmetics and what’s even more fun is that it changes colour depending on the pH of the solution it’s in. 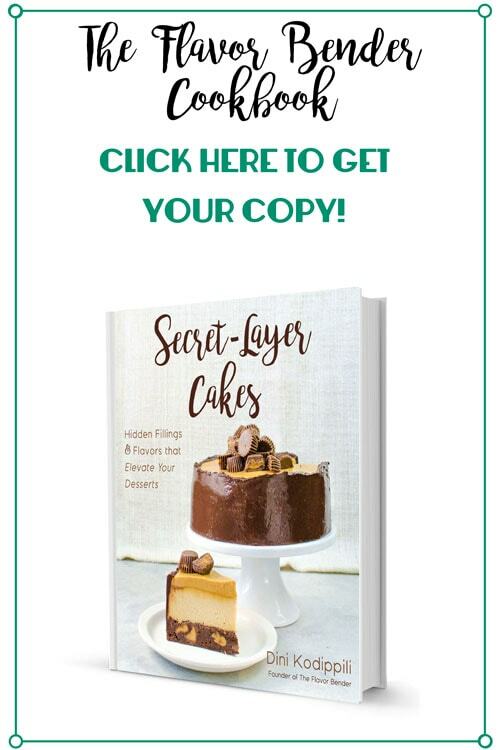 6th grade science came roaring back as soon as I saw it again and I knew I had to try it in one of my recipes too. So that’s exactly what I did. I got blue ice cubes here that turn purple when they melt into the lemonade! How awesome is that?? So not only do your kids get a fun rainbow lemonade, they also get a science lesson with this one! 😀 They’re magical Color Changing ice cubes that complete the rainbow. And for the adults… feel free to spike your lemonade with some vodka like I did. 😉 Because that’s just the way it’s done around these parts. 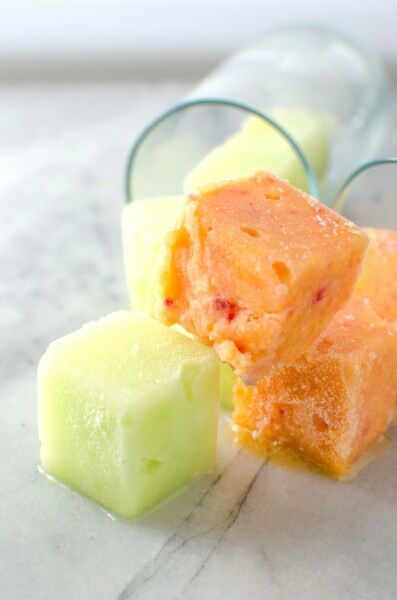 Fill the ice cube trays with the fruit sorbets or pureed fruit. Freeze overnight (Please see note). For the blue Butterfly pea ice cubes, steep the tea bags or dried flowers in boiling water and keep covered for about 5-10 minutes, till you get a beautiful deep blue colour. Drain the liquid and add sugar to sweeten it to your liking. Let the tea cool. 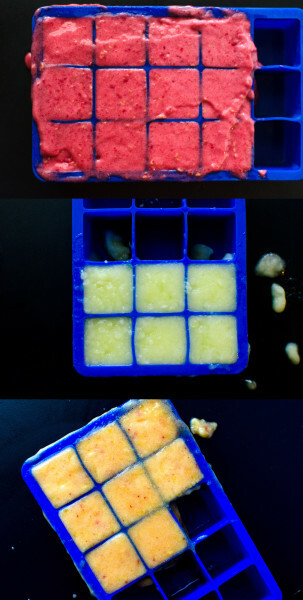 Fill the ice cube tray with this liquid and freeze overnight. When the ice cubes have frozen, remove them from the tray and store them in plastic freezer bags (this is just for convenience). 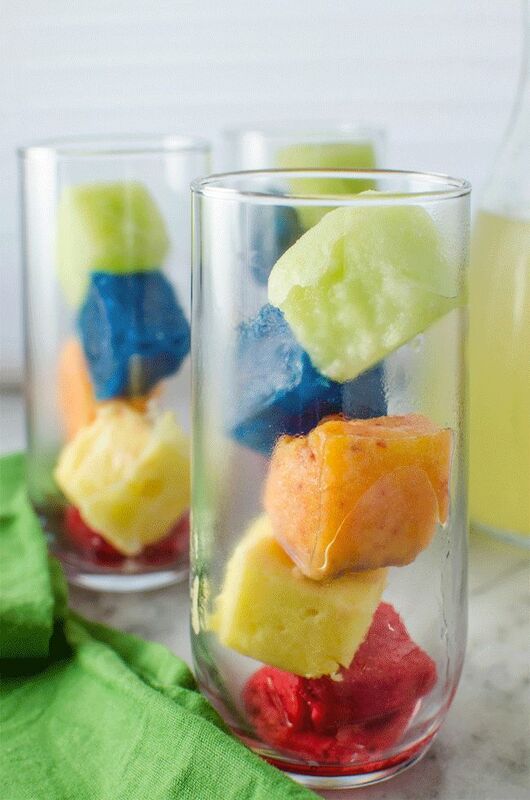 When ready to serve, place rainbow ice cube each in a glass, and fill with lemonade about ¾ of the way - if you're topping it with vodka, or all the way - if you're not adding alcohol. You can leave it out for a few minutes or until the rainbow ice cubes start to melt (especially the blue Butterfly pea ice cube), before serving. 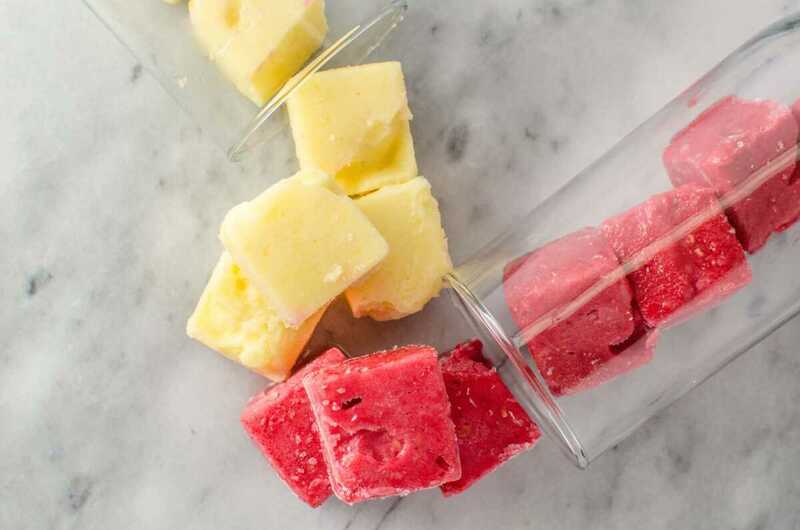 Note - You can use any ice cube tray, but silicone trays will release the sorbet ice cubes more easily. What I loved most about this drink is that as the coloured sorbet ice cubes melt into the lemonade with time, they yield incredibly intense fruity flavours, to give you a spectacularly refreshing and beautiful drink. I might even consider adding some mint in there for good measure. With all those intense fruity flavours and the blue ice cube melting into purple liquid, your kids might even be tricked into thinking that this is a super fun dessert! Nothing like a little sleight of hand to get your kids to enjoy some fruits, amiright? 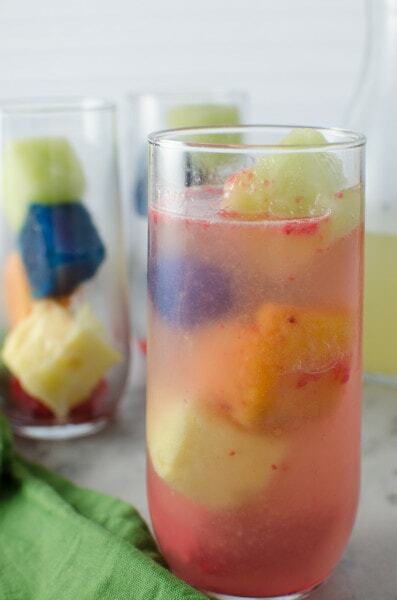 If the fruit flavours are too strong for you, you can tone it down by mixing in some water (or some vodka! 🙂 ). It maybe the end of summer, but these fruity rainbow ice cubes are going to be a permanent resident in my freezer from here on out. The possibilities are just too darn fun! 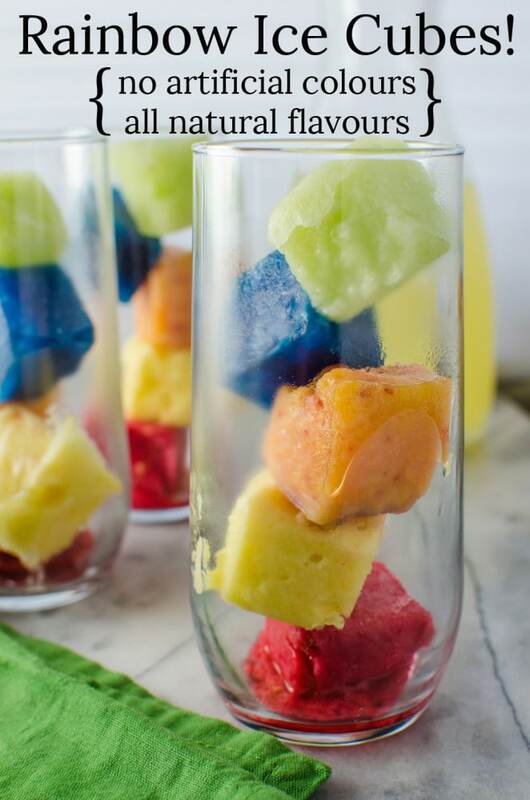 If you liked this naturally coloured and flavoured rainbow ice cubes recipe, don’t forget to subscribe for new (and free) recipes and updates by entering your email address below (and get all these recipes delivered straight to your inbox), so you don’t miss out on a thing. You can find me on FACEBOOK, TWITTER, INSTAGRAM, PINTEREST and GOOGLE-PLUS too. You and I have always been on the same wavelength Christine! 😉 hahaha! I have never heard of butterfly pea tea, something has been missing in my life. Love the science project in a glass, and lack of any artificial color. Beautiful and fun! I’m loving your idea for Butterfly Pea tea! Sounds so fun to have it turn from blue to purple. 🙂 Your rainbow ice cubes sounds pretty awesome too – loving the flavor and colorfulness without artificials! That is such a ‘cool’ idea!! Thank you Winnie! I love colours in food too 😀 It makes desserts so much more fun right? This is absolutely brilliant and so fun for cocktails too. It is still like a million degrees in hong kong so can’t wait to make a few of these for tomorrow lemonades. Pinned! Thank you Helen! It’s like a cool fruity lemonade cocktail! It’s awesome 😀 Much better than artificially coloured water! This looks so beautiful and I loved the gif! Thank you Abida! 🙂 I have a thing for gifs. haha! Love this post. It would never occur to me to use anything but natural colours, but it had never crossed my mind to make coloured ice cubes. What a wonderful idea. I’ve never heard of the butterfly pea before either – how very interesting. This is really clever Dini! The colours are fantastic! What?! This is such a cute idea – perfect for hot summer days! Thank you Sarah! 😀 It is perfect for those hot sticky days!